What’s better than a cake to celebrate my first year of Blogiversary at ‘Chitra’s Healthy Kitchen’. Today’s post is to celebrate the day hence this is different from my regular Healthy recipes. 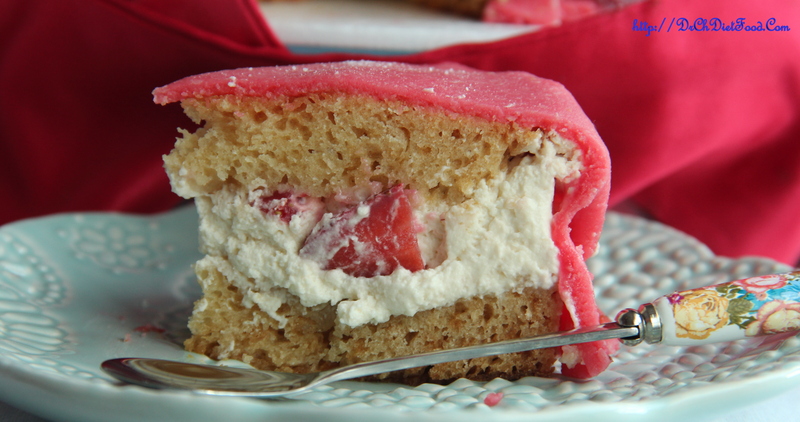 Here’s what the cake looks like on the inside, layers of sponge cake whipped cream, and topped with marzipan. In a bowl sift in flour, baking powder, baking soda, salt in a bowl and set aside. Now in other bowl beat condensed milk, oil in an electric mixer/hand whisker until light and fluffy. Now fold in flour mixture to the condensed milk mixture, water and mix in batches until a dropping consistency batter is obtained. Pre-heat the oven at 170deg C (fan assisted), grease and line the baking tray and pour the prepared batter. Bake in the pre-heated oven for 30-40 minutes/until the toothpick inserted comes out clear. Grind the blanched and peeled almonds to make a fine powder. Now in a pan add sugar, water and heat until the sugar melts and continue to boil for 4-5 minutes more/until slightly thickens. Allow the sugar mixture to cool a bit. Then stir in ground almond and mix until a stif dough is formed. If the dough is still too wet and sticky, add more powdered sugar and grond almonds. (it becomes firmer after its been refrigerated). Turn the almond marzipan out onto a working surface and knead it a few time. Form it into a log, wrap it up in plastc wrap and refrigerate for sometime. Place a clean bowl, and the whip attachment in the freezer for 10-15 minutes. When the preparation work is completed and it is time to assemble the cake. 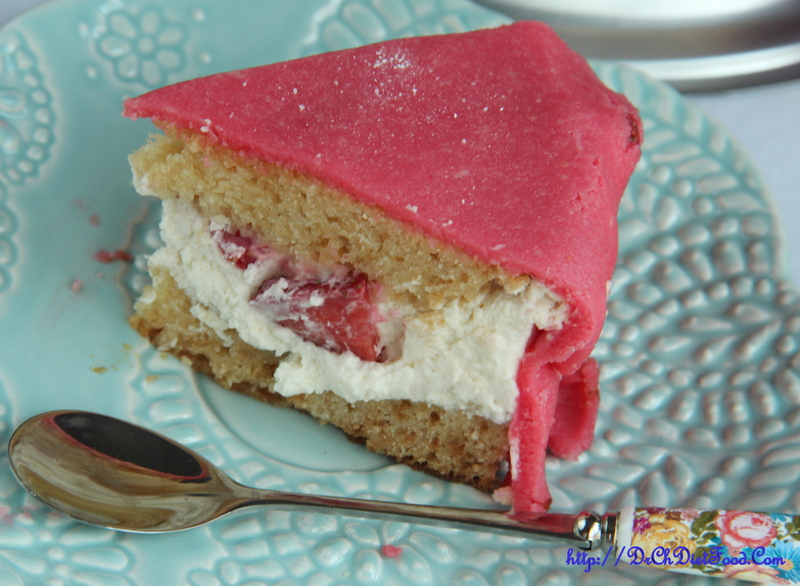 Using a 6 inch cake ring or a spring form pan as a guide, cut two circles out of the cake. First layer: Place one slice of the cake on the cake circles and brush some sugar syrup. 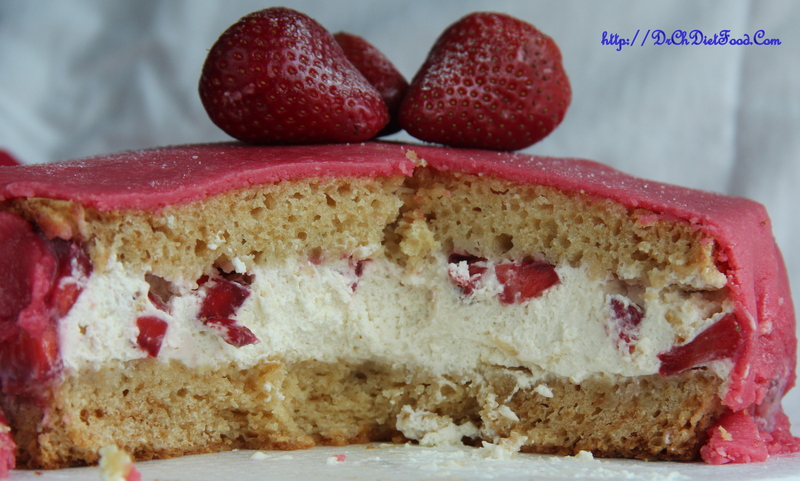 Fourth layer: Place the second layer of the cake on top of the strawberry layer. 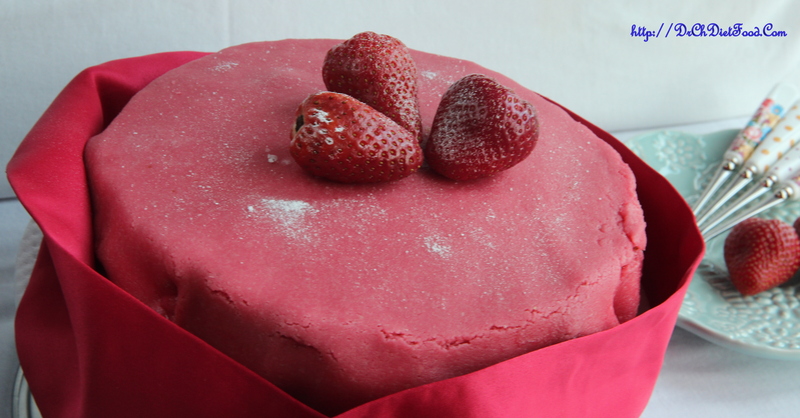 Refrigerate the cake for 2 hours before topping with marzipan. 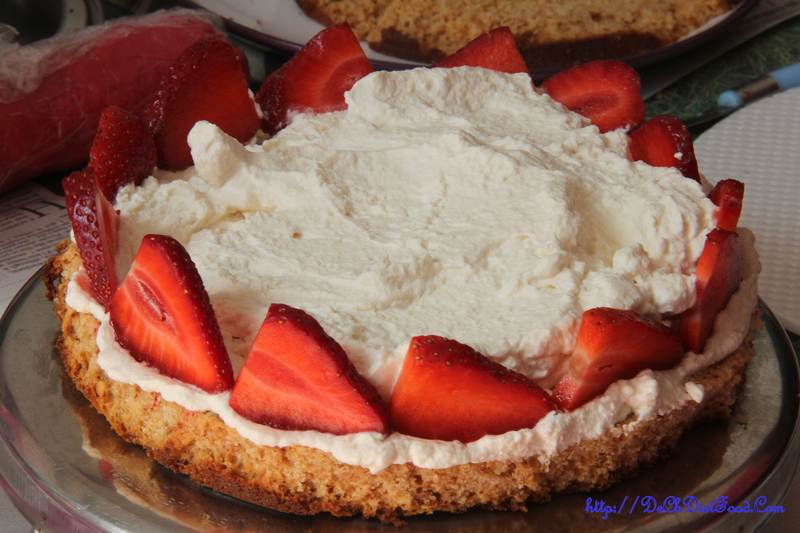 Meanwhile: Before placing marzipan apply a thin layer of whipped cream on top and sides. Fifth layer: Dust some powdered sugar as needed to prevent sticking of the marzipan. Using rolling pin roll the marzipan to thin sheet and carefully place the marzipan layer over the cake and trim the edges. Marzipan can be stored in the refrigerator for atleast 15-20 days. So it can be made ahead of time. Frosting and decorations can be personalised. 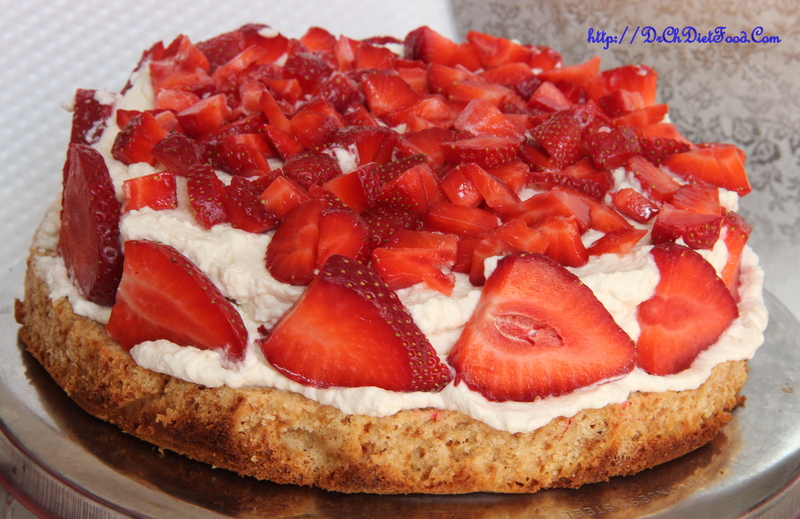 Posted on April 17, 2015, in Dessert, International, Kids recipes. Bookmark the permalink. 79 Comments. a celebration isn’t a celebration with cake! congratulations. 365 healthy recipes yumm…☺Sorry for being so greedy but cant help. We have all got used to your healthy food. This looks great! Homemade Marzipan? I never knew how before. Thanks for posting! Thank you sir for your continued support. Thank you Sir for your continued support, blessings, encouragement…..
Congratulations on your blogiversary. 550 posts in one year is quite an achievement…! That cake is absolutely beautiful and I’m sure tastes wonderful! Congratulations on one year! Congratulations! That is quite a milestone and we look forward to many more! Congratulations, Chitra! What a prolific blogger you are – thank you for inspiring me! C O N G R A T U L A T I O N S – CH I T R A !!! Perfect for a celebration. Congratulations, Chitra! Congrats Chitra…Wish you many more happy years of blogging…. Compliments! Yours is a wonderful blog: coloured, rich, spicy and exotic! Congratulations, Chitra! Best wishes for your blog anniversary! Oh, wow! 550 posts? Congratulations and happy 1st Blogiversary! The marzipan cake looks beautiful and I bet delicious too. Have a lovely weekend. Congratulations Chitra and your cake looks fantastic 🙂 Love the marzipan on top! Congratulations for 550th Post and on completing your 1st year at WordPress. 550 posts in year i.e. 45 posts per month and it means more then 1 post daily… its really inspiring to all. Hoping to see many more new healthy recipes. Yummy. And Congratulations on your anniversary! Happy first anniversary Chitra – you have done so well in one year – keep it up…I really enjoy your posts! 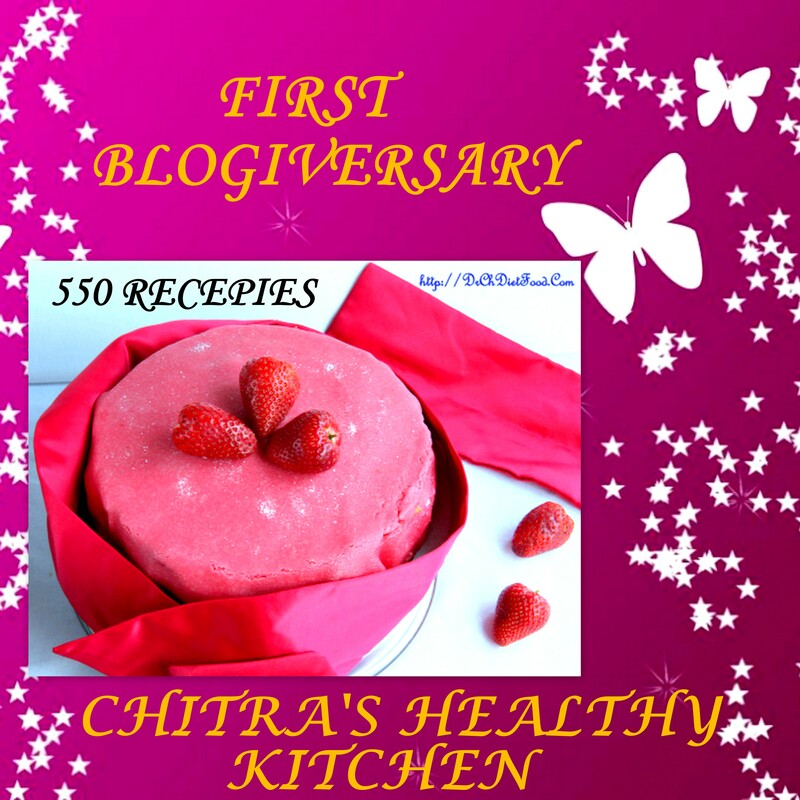 Congratulations Chitra, wishing you many more blissful moments churning out fantastic recipes and posting wonderful blog posts for us. Baking cake is a must for my celebrations, hence totally agree with you on this. Loved the post, will try making the Marzipan someday soon. Gorgeous cake and many congratulations ! Thanx a bunch for your wishes….